February media attention to climate change and global warming was up 9% throughout the world from the previous month of January, and up 63% from February 2018. While Asia, Middle East and Central/South America coverage was down 8%, 12% and 15% respectively from the previous month, it was up in all other regions. For examples, coverage in Europe was up 8%, Oceania coverage increased 34% and North America media attention went up 8% in February compared to the previous month. Figure 1 shows increases and decreases in newspaper media coverage at the global scale – organized into seven geographical regions around the world – from January 2004 through February 2019. Figure 1. Newspaper media coverage of climate change or global warming in sixty-six sources across thirty-six countries in seven different regions around the world, from January 2004 through February 2019. Figure 2 shows word frequency data in United States (US) newspaper media coverage in both January 2019 and February 2019. Despite a waning Trump influence in January (see word cloud depiction in Figure 2, left), his influence in media coverage in the US returned in February (see word cloud depiction in Figure 2, right). The slow disappearing feature of a ‘Trump Dump’ (where media attention that would have focused on other climate-related events and issues instead was placed on Trump-related actions, leaving many other stories untold) was counteracted by Trump Administration (in)action in the month of February, such as an absence of mention of climate change in his State of the Union address (that sparked media remarks) and the presence of Trump Administration critiques of the proposed ‘Green New Deal’ (see below for more). Figure 2. Word cloud showing frequency of words (4 letters or more) invoked in media coverage of climate change or global warming in United States newspaper sources in January (left) and February (right). Data are from the Los Angeles Times, The New York Times, USA Today, The Wall Street Journal and The Washington Post. In February, there were many media stories about climate change that touched on political and economic content. In the US, committee hearings in the House of Representatives generated considerable media attention in early February. 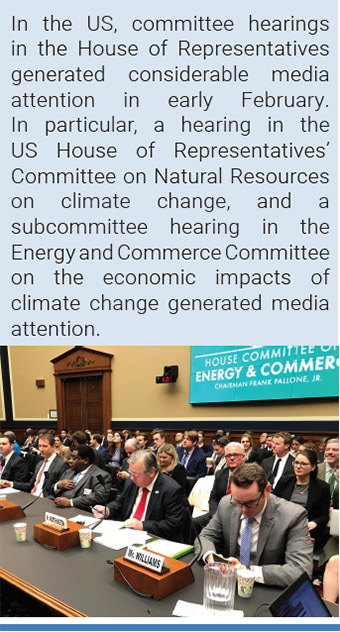 In particular, a hearing in the US House of Representatives’ Committee on Natural Resources on climate change, and a subcommittee hearing in the Energy and Commerce Committee on the economic impacts of climate change generated media attention. For example, MSNBC ran with the headline ‘The House – finally – cares about climate change again’ while journalist Jen Christensen from CNN noted, “President Donald Trump did not mention climate change or any efforts to help the environment during his State of the Union address Tuesday, but members of the US House of Representatives held two hearings Wednesday on Capitol Hill to take a closer look at the threat of climate change”. Stephanie Ebbs from ABC News reported on dueling personalities in the hearings when she noted, “ranking Member Rob Bishop, R-Utah, raised concerns the hearing was too broad and not focused enough on the committee’s jurisdiction, which is federal conservation programs. Bishop said he wants to the committee to spend more time talking about how forests can be managed to promote clean air and protect states from smoke pollution as a result of wildfires in states like California…”I have to mention I’m kind of a loss, I don’t know where this hearing is going or the other six you have planned because you haven’t told us what the goal is. At some point we may be asking, where are we going? What is the real legislation to help people that is supposed to come out of these hearings? To understand whether these hearings are for those of us around the horseshoe that are going to make legislation or this group that’s sitting at a table in the corner so they can write cute stories,” Bishop said, point toward reporters in the hearing room”. 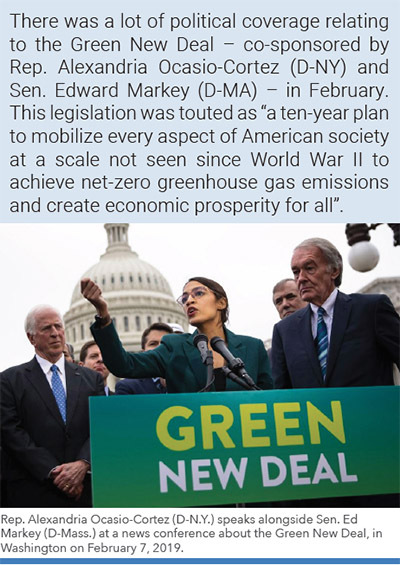 There was a lot of political coverage relating to the Green New Deal – co-sponsored by Rep. Alexandria Ocasio-Cortez (D-NY) and Sen. Edward Markey (D-MA) – in February. This legislation was touted as “a ten-year plan to mobilize every aspect of American society at a scale not seen since World War II to achieve net-zero greenhouse gas emissions and create economic prosperity for all”. Journalists Lisa Friedman and Glenn Thrush from The New York Times reported, “Liberal Democrats put flesh on their “Green New Deal” slogan on Thursday with a sweeping resolution intended to redefine the national debate on climate change by calling for the United States to eliminate additional emissions of carbon by 2030. The measure, drafted by freshman Representative Alexandria Ocasio-Cortez of New York and Senator Edward J. Markey of Massachusetts, is intended to answer the demand, by the party’s restive base, for a grand strategy that combats climate change, creates jobs and offers an affirmative response to the challenge to core party values posed by President Trump…as a blueprint for liberal ambition, it was breathtaking. It includes a 10-year commitment to convert “100 percent of the power demand in the United States” to “clean, renewable and zero-emission energy sources,” to upgrade “all existing buildings” to meet energy efficiency requirements, and to expand high-speed rail so broadly that most air travel would be rendered obsolete. The initiative, introduced as nonbinding resolutions in the House and Senate, is tethered to an infrastructure program that its authors say could create millions of new “green jobs,” while guaranteeing health care, “a family-sustaining wage, adequate family and medical leave, paid vacations and retirement security” to every American”. Meanwhile, USA Today reporters Elizabeth Weise and Ledyard King noted, “The Earth is facing a climate change deadline, with a looming tipping point into a dramatically changed, less hospitable planet – and Democratic lawmakers are beginning what’s likely to be a long discussion over how best to deal with it. These first attempts have coalesced under a Green New Deal championed by Rep. Alexandria Ocasio-Cortez, D-N.Y., and Sen. Edward Markey, D-Mass”. As an illustration on US television, Amna Nawaz and William Brangham from PBS Newshour discussed the scale and scope of the plan with co-sponsoring US Senator Ed Markey. In addition, a new ‘scorecard’ from the League of Conservation Voters was released late in the month, and this generated additional media attention in the US. It found that the differences in positions taken on climate change between Democrats and Republicans is stark, where the former has increasingly engaged with the issue over the past year. For example, journalist Dino Grandoni from The Washington Post reported “Democratic voters will have to decide among a slate of White House hopefuls tripping over themselves to commit to tackling climate change and other environmental issues. But which Democratic senator had the best environmental voting record in Congress last year? The answer: all of them. Each senator who has announced their candidacy for president received perfect scores in an annual voting scorecard kept by the League of Conservation Voters. The six declared 2020 candidates in the Senate — Sens. Cory Booker (D-N.J.), Kirsten Gillibrand (D-N.Y.), Kamala Harris (D-Calif.), Amy Klobuchar (D-Minn.), Bernie Sanders (I-Vt.), Elizabeth Warren (D-Mass.) — always aligned with positions the environmental organization deemed ‘pro-environment’. So too did a handful of Senate Democrats thought to be considering a run for president, including Michael Bennet (D-Colo.), Sherrod Brown (D-Ohio) and Jeff Merkley (D-Ore.)”.